On another Sunday while I visited Jawahar Kala Kendra, I visited a Design Exhibition held by INIFD, Pearl Academy Jaipur etc. The Exhibition was on the first floor and there were sketches of Fashion-wear, some Paintings and even Photographs on the walls. They were also enrolling students for design courses. Surprisingly, one girl approached me and asked me whether I was looking to get enrolled for a design course. Of course, I said No, but I was happy that she considered me young enough for it, aka probably a teenager ;) I am 37 by the way, now. Haha. Anyways, While one my way back, I saw this Triangle being formed between the Side Rails of the Staircase that I was supposed to take on my way out. I flipped the screen to the LCD view, Selected the Monochrome settings and Focused right on the White Triangle. I took about 6-7 shots and about 5 minutes to finish shooting, as a lot of people were coming in the frame. 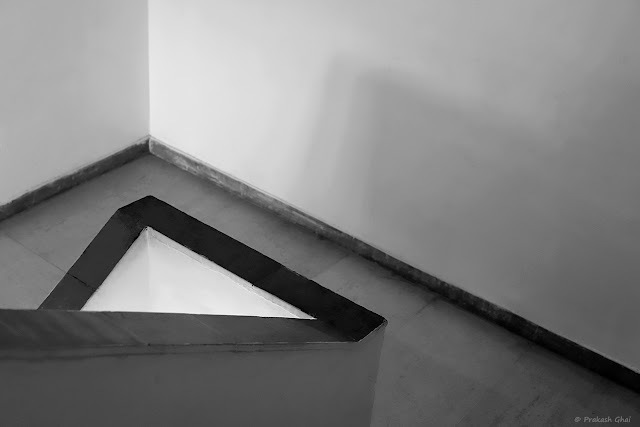 Hope you enjoyed the White Triangle Minimalist Photograph. Thank you for your time. Have a Nice Day. !